Gladys Elnora Gariety, 98, Sidney, Ohio, passed away peacefully on Tuesday, March 20, 2018, at Dorothy Love Retirement Community. She was born on March 16, 1920, in Shelby County, the daughter of the late John and Christena (Pulfer) Scherer. She graduated from Sidney High School with the Class of 1938. On November 24,1938, she married Francis Gariety, who preceded her in death September 19, 1994. Francis and Gladys had 4 children, all of whom survive: Lawrence (Louise) Gariety, of Lake Park GA; Howard (Suzan) Gariety, of Anna OH; Patricia (Lawrence) Geise, of Celina OH; and Edward (Karen) Gariety of Sidney OH. Gladys had nine grandchildren: Jamie Gariety, Tony (Petra) Gariety, Jenny (Matt) Bertsch, Michelle (Doug) Leist, Marc (Linda) Geise, Matt (Brenna Farrell) Geise, Brian (Kristen) Geise, Lindsay (Zach) Geuy, and Nicholas Gariety (Jenna and Riley). Also sixteen great grandchildren: Ana Beil, Phil Bertsch, Sydney Rogers, Andrew, Brooklynn, Mallory, Nora, and Natalie Leist, Marco and Mia Geise, Beckett and Clara Geise, Brynn Geise, and Mack, Zane and Crew Geuy. One great grandchild, Sebastian Bertsch, preceded her in death, in addition to siblings Lawrence, Bud, Vernon, Walt, Raymond Scherer, and sisters Mabel and Cora. 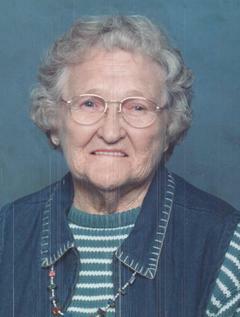 Gladys was a long time member of Holy Angels Catholic Church, Sidney. She enjoyed time at the Senior Center of Shelby County, and was also a member of the Widows Club and the Sacred Heart Altar Society, and did quite a bit of volunteer work. She especially enjoyed playing games and cards with her children and grandchildren. Her face always lit up when she saw her grandchildren and great grandchildren. Gladys babysat for the neighborhood families, and they still, even all these years later, refer to her as Grandma Gariety. She was also an avid quilter, and made beautiful comforters for her family. She enjoyed her flowers, watching her birds, and sitting in her swing. Years ago, Gladys enjoyed working at Shady Bowl Raceway. Gladys and Francis spent 20 plus years wintering in Pine Island Florida. Condolences may be made to the Gariety family at www.salm-mcgillandtangemanfh.com and as per Gladys's wishes, funeral services are private. In lieu of flowers, memorial contributions may be made to Holy Angels Catholic Church in Gladys's name. Private interment will be at Glen Cemetery in Port Jefferson, in her mausoleum. Salm-McGill and Tangeman Funeral Home is in charge of the arrangements.